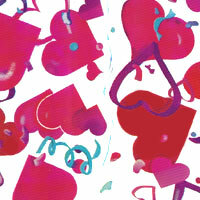 Hearts and Confetti Cellophane Roll 24 inches wide x 50 ft long. Dark red and purple hearts among confetti in red, teal and purples. Cello background is clear.